Оборудование для макаронной промышленности купить в Алматы. Оборудование для макаронной промышленности заказать по выгодной цене - Uni-Tech. Фото, описания, характеристики, отзывы. Доставка по Казахстану. 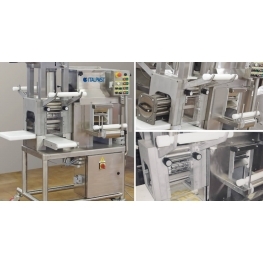 The lasagne machine-cutting machine is suitable for automatic production lines of fresh pasta obtained either from sheet or from pasta die. 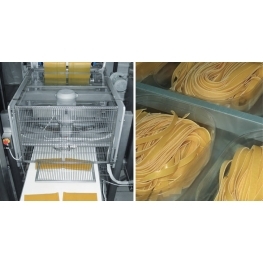 This pasta machine can operate in two modes, lasagne or tagliatelle, and is made up of a conveyor belt for sheet pasta or for long pasta, a cutting group for tagliatelle, a cross-cutting group (or guillotine) and a unit for lasagne stacking. The PLC-equipped electric control panel automatically controls machine operation in the two running modes. 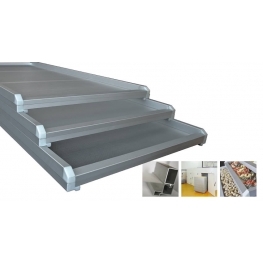 Featuring automatic stacking device for lasagne sheets to be packaged in trays. 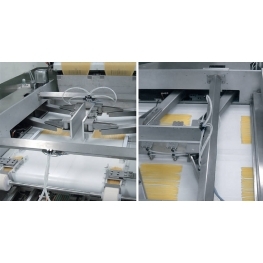 A piece-counting device enables to stack the desired quantity of pasta sheets and then discharge them onto a conveyor belt located underneath. A version is available equipped with suitable device to put a sheet of paper between each sheet of pasta. Featuring interchangeable cutting groups and pneumatic cross-cut to determine cutting length and relative weight. 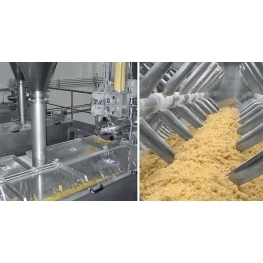 Presenting the first, complete, automatic production line for short pasta and dry spaghetti in the medium production range has been an important event in the history of dry pasta production. 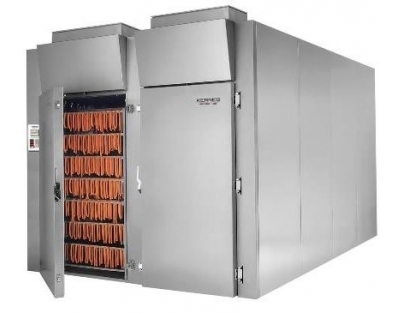 The spaghetti production unit featuring output from 200 up to 600 kgs per hour fits perfectly any requirements of all those pasta producers approaching the world of dry spaghetti for the first time. Years of experience and engineering have enabled to obtain such results so that today everybody can start long pasta production. 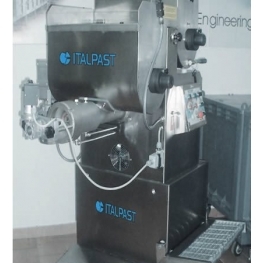 Besides the production line by extruder MAC320 (see picture) Italpast can supply a fully automatic spaghetti production plant for 200 kgs per hour by extruder mod. MAC 220 with round extrusion head and spaghetti-spreading machine on sticks measuring 600 mms. in length. As to spaghetti production for 600 kgs per hour, extruder mod. MAC 600 with linear extrusion head and spaghetti spreading machine on sticks measuring 1200 mms. in length are used. 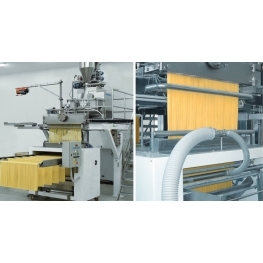 Thorough knowledge of dry pasta production in combination with first-rate quality machines is the best recipe for trouble-free spaghetti production. To ensure superior quality product the complete production process needs accurate check, as well as development of an advanced technology concerning the various machines making up the production line, mainly dryers, which adopt specific settings enabling correct drying. 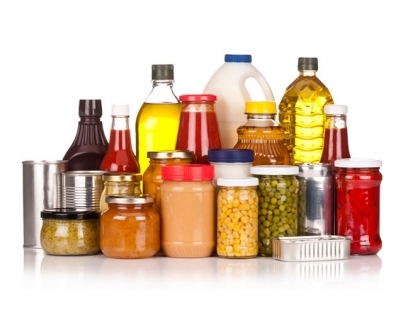 Some standard models have been designed for the production of special products, such as “angel hair” 0,6 mms, “candele”, “ziti”, etc. 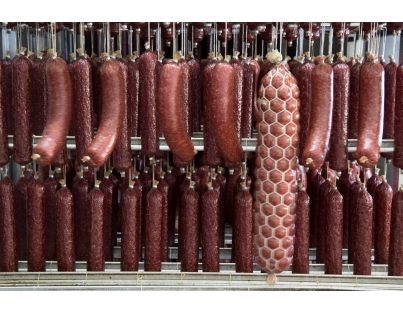 Machinery for the alimentary industry must comply with high hygienic standards and this is mostly true as far as drying or dehydration of fresh alimentary products is concerned. Our company propose a new technological solution: looms featuring light alloy profiles in anodized aluminium and heat-resistant, polyester meshed-net, suitable for any kinds of static drying of products to be dehydrated, such as fruit, vegetables and, of course, pasta. These looms are used for any kind of handling, either manual or automatic thanks to their sturdiness and non-deformability. 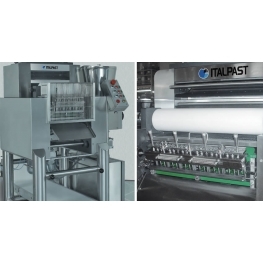 Automatic machine for the production of fresh pasta of the short-cut, ravioli, tagliatelle and lasagna type. 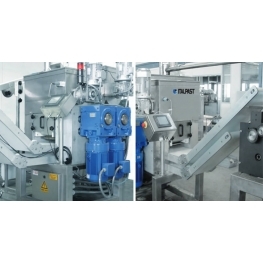 Automatic, patented machine for the production of all pasta shapes. SHEETER: sheet pasta mm. 160 in width. EXTRUDED: spaghetti, macaroni, fusilli, penne and other shapes. RAVIOLI: double-sheet ravioli, different shapes, produced one-by-one. TAGLIATELLE: this machine also produces tagliatelle, sheet-pasta for lasagna, “quadrucci” (pasta in square shape), “tagliolini”, “spaghetti alla chitarra”; thanks to a 4-position mould various cuts can be chosen. Thickness and length are adjustable. 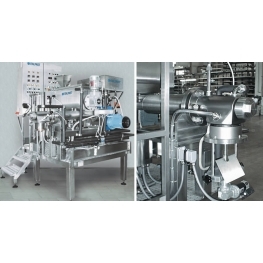 The machine can be equipped with single or double mixing basin, suitable for production of medium quantities of filled pasta, extruded pasta, tagliatelle and sheet pasta for lasagna production. Most suitable for pasta shops, labs, restaurants, supermarkets, etc. Manufactured with high quality materials this machine enables production of many kinds of pasta by simply changing the relevant moulds. Simple construction enables also easy disassembly of all parts for full cleaning. 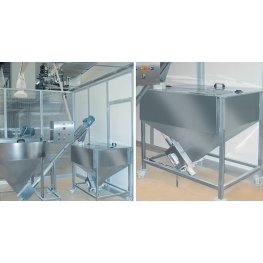 All parts in contact with pasta and filling are in stainless steel and material suitable for contact with foodstuff. All safety devices comply with the standards in force. 380 V- 50 Hz – three-phase. 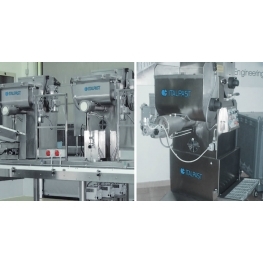 Ideal machine suitable for medium and large industries requiring careful preventive check of technical and technological functions linked to extrusion. testing new dies, new pasta shapes. 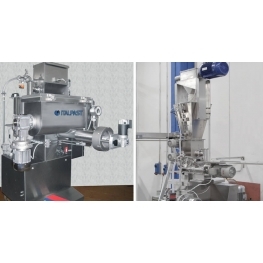 MIXING AND HYDRATION OF THE RAW MATERIALS with control of temperature of dough thanks to independent thermostatation circuit, control of mixing shaft speed (completely dismountable for cleaning and washing operations). COMPRESSION by single-screw group in stainless steel, independent thermostatation circuit of the extrusion cylinder, independent thermostatation circuit of the extrusion head, control of compression screw speed, control of pressure inside the extrusion head. CUT. Pasta cutter group complete with knives and speed control with optic eye for impulse-cutting. 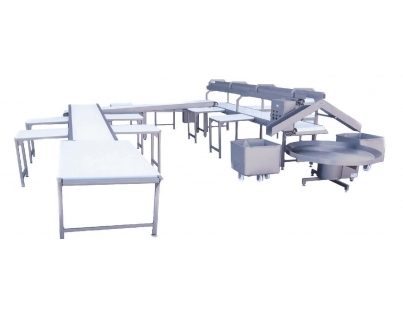 Machine built on a fully stainless steel platform, enabling full access to the mechanical organs and to thermostatation basins. Electric control panel in stainless steel casing IP65 fitted on board of the platform. 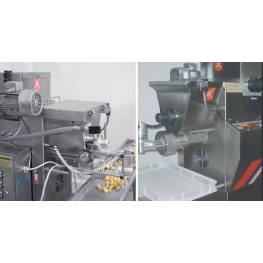 The forming machines for ravioli and cappelletti model RCA 250 feature solid design and sturdy structure. 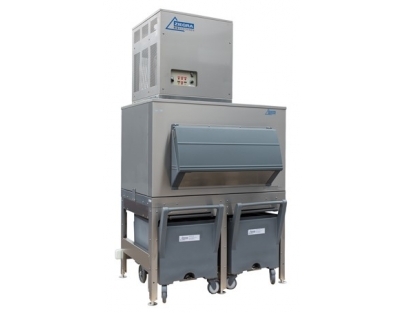 All parts in contact with the product are in stainless steel AISI 304, simple to disassemble for easy cleaning. 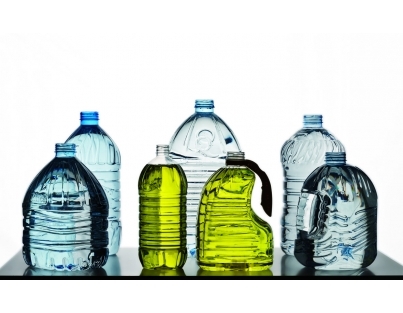 The high quality commercial items can be easily found on international markets. The forming mould is interchangeable by simple and fast operation. 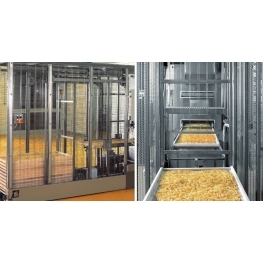 The mould stroke rate is adjustable depending on the product size you wish to obtain. Sheet thickness and quantity of filling are also adjustable. The forming machine can be completed with scrap-cutting system and group of conveyors for scraps recover. 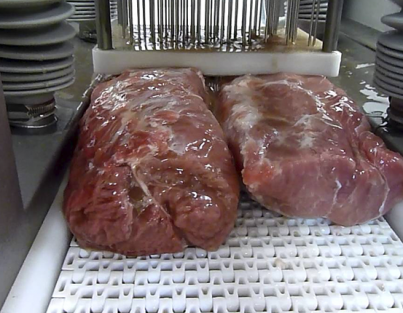 The filling dosage device is fully independent and can be removed to enable washing operations. The electric control panel is equipped with PLC and keyboard for programming and storing of working phases. 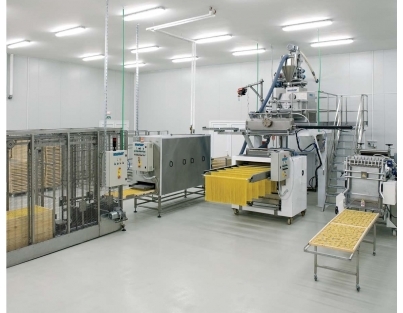 The machine has been designed and manufactured to continuously and simultaneously feed two ravioli and cappelletti machines or a double-sheet ravioli machine. The sheeter can also operate by one exit because it is equipped with two independent motorization systems. The rolling shafts and cylinders are fitted horizontally. 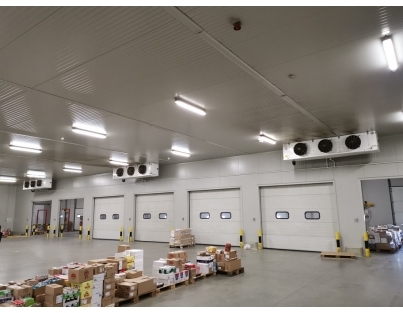 The particular opening of the shutters enables careful cleaning of the internal parts, carried out under the maximum safety conditions for the operator. The laminating-shaft group is equipped with distanced mechanics. All parts in contact with the product are in stainless steel AISI 304. Оснащен инновационной пневматической системой извлечения тележки. Вся конструкция целиком выполнена из нержавеющей стали. Машина работает по электро-пневматическому принципу, разработана для автоматической укладки поддонов получаемых из машины подачи поддонов, машины производства «гнезд» или прочих формовочных машин на сушильные тележки, что позволяет достичь максимальной эффективности производственной линии для производства макаронной продукции. Машина оборудована инновационной пневматической системой извлечения тележки в конце загрузочного цикла, системой передачи поддона посредством передаточной цепи и направляющих для фиксации поддонов даже при работе, в случае если оператор и/или тележка временно отсутствует. Корпус и защитные сетки целиком выполнены из нержавеющей стали. Особые версии для поддонов специальных размеров и форм доступны под заказ. -Устойчивы, железный контрольный панель, оснащенный контролем, безопасностью, устройствами аварийной сигнализации, контролируемые электронным видом PLC. Машина для производства паст в комплекте с накапливаемым устройством подходит для автоматизации длинных, свежих паст в упаковке. В машина для производства паст работает электро-пневматично, подходящий для автоматической упаковки для спагетти в пакетиках или поддоне, которые должны быть включены производство свежих макаронных линий. Оснащен сквозным лезвием, шириной 600/1000 мм/с, в зависимости от модели, синхронизированы с боковыми выдвижными блоками для производства пасты. Специально оснащен для резки паст тальятелле или для других пасты. Линия операционных функции и синхронизации контролируются PLC и программной клавиатурой. Оснащенный взбивателем и спироматическим конвейером бак применяется для передачи любого вида муки в бункер миксера. Спироматический конвейер с гибкой трубой из пищевого рилсана длиной до 12 м.
Разгрузочный конвейер укомплектованный верхней заслонкой для контроля и взбивателем, представляющим собой электровибратор с эксцентриками. Система валюметрического дозирования муки в бункер миксера, которая может программироваться блягодаря таймеру, а так же датчикам уровня. Модель 250 л, установленный на независимые опорные колеса. Модель 450 л, с конвейером, закрепленным на бункере миксера. Модель 500 л с миксером. специальные решения под минимальный и максимальный уровень наполнения. Дозация "batch" continuo "batch" continuo "batch"
Непрерывные миксеры для изготовления макарон, производительностью от 300 до 1000 кг/час. Оснащены турбомиксером. Применяются для непрерывного приготовления и гидротации теста используемого для производства: листовых макарон при помощи автоматических тестораскатчиков, длинорезные и короткорезные макароны при помощи экструдеров, специальные национальные типы макарон. В основном они используются в непрерывных линиях с возможностью подачи теста автоматически на несколько (до 8) станций посредством конвейера или челночной системы (см. SH модели). Система дозировки муки посредством накопительного бака с уровнями и вибродном. Смесительный бак с установленными коническими лопатками, способными вращаться в любом направлении, решетка безопасности, предварительно оговоренный циклонный улавливатель для переработки обрезков. Установка дозировки яиц и прочих жидких добавок. Дизирующий бак для яиц и жидких добавок емкостью от 150 до 600 литров. Подача муки из силоса или накопительного бака. Подготовка для размещения циклонного уловителя для автоматической системы переработки обрезков.